Innovative materials, optimal comfort, and simple elegance – these are the qualities that make the watches from the Swiss manufacturer Rado so unique. 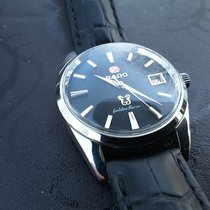 Anyone looking for a truly special watch will find what they are looking for with Rado. 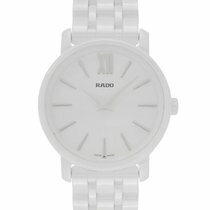 Rado is known for using innovative and state-of-the-art materials for their watches. Starting in the early 1960s, the Lengau-based manufacturer was already beginning to use uncommon materials like carbide and sapphire glass in addition to stainless steel. This continues to be a major area of interest for Rado today. Their main focus has been on ceramics, such as plasma high-tech ceramic and composites like Ceramos, which is made of ceramic and metal. These materials stand out from the pack: They are light, hard, and scratch-resistant while also containing hypoallergenic properties. Depending on the model, these materials are used for the cases, bands, and even the dials, giving these classically elegant, minimalistic watches a unique appearance. 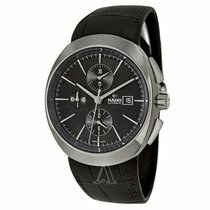 Rado's catalog is comprehensive and includes elegant dress watches as well as retro models, skeleton watches, and chronographs. They are powered by either mechanical automatic movements or quartz movements from ETA. It's easy to tell which movement type your watch has: Mechanical Rado watches all have a small anchor on their dials. HyperChrome is Rado's most comprehensive and diverse collection. The HyperChrome Automatic Chronograph is one of the collection's highlights. It has a monobloc case made of one piece of ceramic, making the usual stabilizing stainless steel core superfluous. Depending on the ceramic, the cases and bands come either in matte gray or black hues or in a metallic silvery shine. They are the perfect frame for the sporty and modern dials that match the color of the case. 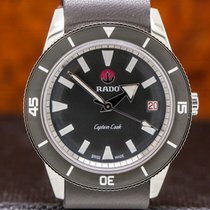 Rado has equipped these watches with a proven automatic ETA movement to guarantee reliability and functionality in addition to their already stunning appearance. You can find a HyperChrome Automatic Chronograph for between 2,790 and 4,000 euros depending on the model. These watches are also available in stainless steel with a ceramic bezel. This version is powered by an ETA quartz movement and costs around 1,200 euros. Watches from the HyperChrome Automatic line are sporty dress watches and measure 42, 38.7, or 30.6 mm in diameter. While the Swiss manufacturer chose high-tech ceramic cases for the larger models, the smaller models are stainless steel with a composite Ceramos bezel. The selection of designs is, once again, quite diverse, though the watches still feel elegant and reserved thanks to their tidy dials. Prices for these watches start at around 1,300 euros. The bolder HyperChrome Automatic Diamonds has diamonds on its dial and bezel. Plan to spend between 2,100 and 3,850 euros for one of these watches. The retro HyperChrome 1616 is a modern version of the Cape Horn first introduced in the 1970s. This watch has a striking square pillow shape and a large crown protector. Its case is made of either hardened titanium or black, high-tech ceramic with matching dials. Distressed leather straps serve to further underscore the retro feel of these timepieces. An automatic ETA caliber ticks away inside these three-hand watches and provides them with a day-date display. A mint-condition HyperChrome 1616 costs about 2,100 euros. The HyperChrome Captain Cook also exudes a vintage feeling. It is a remake of a diving watch with the same name from 1962. 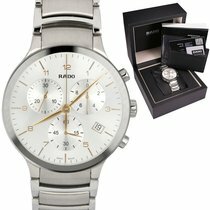 Rado offers this watch as a 37-mm stainless steel limited edition of 1,962 pieces and a 45-mm titanium version with various band options, including leather, stainless steel, titanium, and textile. Unlike the original, Rado equipped the current models with anti-reflective sapphire glass and a scratch-resistant rotatable ceramic diver's bezel. This is also true of the 37-mm stainless steel women's model, which comes with a white bezel and dial and uses diamonds for the hour markers. The HyperChrome Captain Cook is powered by an automatic ETA caliber with an 80-hour power reserve. Depending on the model, be sure to have between 1,590 and 2,350 euros on hand for a Captain Cook. Another highlight in the HyperChrome collection is the HyperChrome Ultra Light. It premiered in 2016 and is incredibly light at only 56 grams. Its case is made of silicon nitride and contains an anodized aluminum ETA movement. This watch comes with a very sparse dial: There are no indices, and its circular pattern has a zen garden aesthetic. A second version has a much more intricate two-level dial with sizeable indices. Both models cost just under 2,200 euros. The Ceramica collection represents a milestone in the history of Rado. It is the perfect combination of minimalistic design, geometric shapes, and state-of-the-art materials. Its rectangular case and bracelet are both made of shimmery black high-tech ceramic and look like one solid piece. While the original Ceramica from the 1990s had a bracelet as wide as the watch itself, industrial designer Konstantin Grcic went with a slightly altered version for the current model. 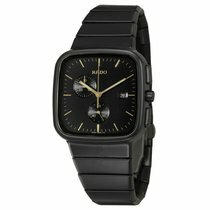 Some other changes from the original: Rado has introduced automatic movements in addition to quartz movements , there is a selection of watches for both men and women, and they have added gray and white models to the catalog. You can get older models starting at as little as 800 euros. Prices for current watches start around 1,300 euros. The Integral is the Ceramica's older sister. 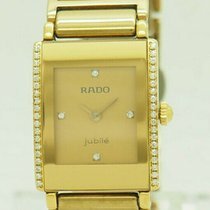 Rado introduced this watch in 1986, and it remains in their catalog to this day. Its bracelet also appears to be integrated into its rectangular case, though the current collection feels a bit smaller. Unlike the Ceramica, Rado equipped the quartz-powered Integral with black or white high-tech ceramic and stainless steel, which has a yellow or rose gold PVD-coating on certain models. Combined with the reductionist dial, this bicolor look lends the watch a particularly dignified appearance. It comes in both men's and women's sizes and goes for prices of around 600 euros. The Integral Diamonds models, on the other hand, feature diamonds on their bezels and cost just under 2,000 euros. In 1962, Rado attracted international attention with the DiaStar 1. Using sapphire glass and carbides, which were originally developed for the tool industry, the Swiss manufacturer achieved an unprecedented scratch resistance. Its oval design with an extremely wide bezel makes this watch a real showstopper. Depending on its condition and age, expect prices of between 200 and 890 euros for a DiaStar 1. This watch has undergone a few developments since its inception. In 2011, Rado released an updated edition called the "D-Star". In addition to its improved materials and more modern dial design, its significantly smaller bezel really sets this watch apart from the DiaStar 1. You should plan to spend around 800 euros on a D-Star. The DiaStar 1 has experienced a resurrection of sorts in the watches from the current Original collection. These watches are available with or without gold plating, with an automatic or quartz movement, and with numerous intricately designed and diamond-studded dials. Set aside around 650 euros for one of these timepieces. This collection also includes chronographs, which cost about 1,000 euros in mint condition. Ceramic can come in a variety of colors, which the True collection makes good use of. The monobloc cases of these classic watches don't just shine in black, white, or metallic but also in blue, green, or brown. Each comes with a matching dial in either a sunburst or mother-of-pearl look. Limited edition models – such as the True Blaze, True Cyclo, and the True Face – were created by renowned designers like Sam Amoia, Philippe Nigro, and Oskar Zieta. As in most Rado collections, there are models with diamond-studded dials as well. You can also choose from a range of sizes and quartz or automatic movements. Depending on the model, prices for a True sit between 600 and 2,100 euros. Watches from the True Thinline collection are much thinner than the models found in the True collection. Variants with a quartz caliber are only 5 mm thick, while those with mechanical automatic movements are only slightly thicker at 7.8 mm. In terms of size and colors, these watches are basically identical to the True models. Prices for the True Thinline start around 1,000 euros. Classic simplicity and diversity characterize the DiaMaster collection. Each watch has a large, clean, and easy-to-read dial that comes in a variety of designs. They range from elegant three-hand watches with diamonds to watches with power reserve indicators and small seconds dials all the way to skeletonized models. The collection even includes neatly designed chronographs. For the DiaMaster, Rado has once again opted for high-tech ceramic, though cases in carbon diffused steel are also available. Quartz or automatic ETA movements power these watches, and most models come with the choice of a ceramic, stainless steel, or leather band. You can get a simpler DiaMaster model for as little as 1,050 euros. More elaborate models like the DiaMaster Grande Seconde start around 1,300 euros. Plan to spend about 2,000 or 4,000 euros for a DiaMaster Automatic Chronograph or a DiaMaster Automatic Skeleton Limited Edition, respectively. Watches from the Centrix collection feature cases made exclusively of stainless steel, many of which have a gold or black PVD coating. Ceramic is only used for the bracelets. The Open Heart models are a real treat to look at. Their intricately skeletonized dials reveal the finely decorated ETA automatic caliber underneath. Other highlights from this collection include the Centrix Automatic UTC with a second time zone, the Centrix Automatic Day Date with day and date displays, and the Centrix Chronograph. Prices range from 700 euros for simple automatic or quartz models to around 1,400 euros for skeleton watches and chronographs all the way up to almost 2,000 euros for the diamond-studded Centrix Diamonds. Rado's story begins in 1917, when brothers Fritz, Werner, and Ernst Schulp founded the watch manufacturer Schulp & Co. in their parents' house in Lengau, Switzerland. For the first few decades, they focused on producing movements for other watch manufacturers. 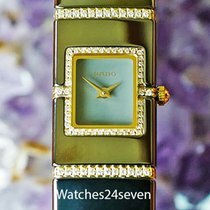 It wasn't until 1937 that they began to bring their own watches to market via their daughter company Rado Watch Co. Rado has been a part of the Allgemeine Gesellschaft der Schweizerischen Uhrenindustrie (ASUAG) since 1968. The ASUAG merged with the SSIH in 1983 and is known today as the Swatch Group. Models like the Green Horse from 1958 helped establish Rado as a premium brand. However, its real breakthrough came with the introduction of the DiaStar 1 in 1962. Since then, Rado has been a pioneer of material science. They continue to prove this with watches like the Sintra, which is made of either titanium carbide or V10K with its tremendous hardness of 10,000 Vickers.